Palm Springs—for years a desert hideaway for celebrities—has a history as unique and varied as its residents. Nestled against lofty Mt. San Jacinto, the oasis of Palm Springs was the ancestral home of the Agua Caliente Band of Cahuilla Indians. In the late 1800s, white men began to arrive, seeking restorative cures in the therapeutic waters of the hot springs. The climate attracted not only respiratory patients and their families, but world-famous artists and writers who sought solace and inspiration in the palm-shaded canyons. Despite floods, droughts, and tribulations, these hardy settlers brought a modern village into being. Get to know the remarkable pioneers who left their mark on this special place. Learn the stories behind the inns, resorts, and businesses that made it famous: the Desert Inn, El Mirador, the Racquet Club, and so many others. 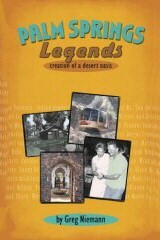 Enjoy a historical, behind-the-scenes romp: Ride the tram, meet the stars, and discover the myriad forces and diverse population that made the Palm Springs area an international destination.